The last English club was knocked out of the Champions League this week – the first time in 17 years that there will be no Premier League representative in the quarter-finals. It's about time someone spent some money on these teams. One of the campest badges in the pantheon. AD Genesis of Panama represent themselves with a high-kicking young man flourishing a Pied à Terre clutch bag. A transcript of the dialogue from the first design meeting is available on the club's website and runs as follows. Club chairman: So, just to refresh our memories because we're none of us here as young as we were (big laugh), what we were looking for on our new club badge was something symbolic of strength, determination, resilience, an iron will. Club chairman (perusing design draft): Yes. What is this? Designer: It's a high-energy anthropomorphised mouse. Designer: Mice are very resilient and dancers, as we will all concede, work pretty damn hard. As do figure skaters. Have to be tremendously strong for the lifts. Club chairman: A mouse cabaret dancer. What is he holding here? "Ebay is the place to go if you any MSV Duisburg-related living room art. But I think the guest on the sofa is mocking this one, or else is having a stroke." The start of the Sun on Sunday's report on Manchester City v Barnsley summons up a heartwarming image of Carlitos the cheery coach driver. Some highlights from the Twitter account Accidental Partridge. "I was trying to think who Phil Jones reminded me of in this photo gallery. 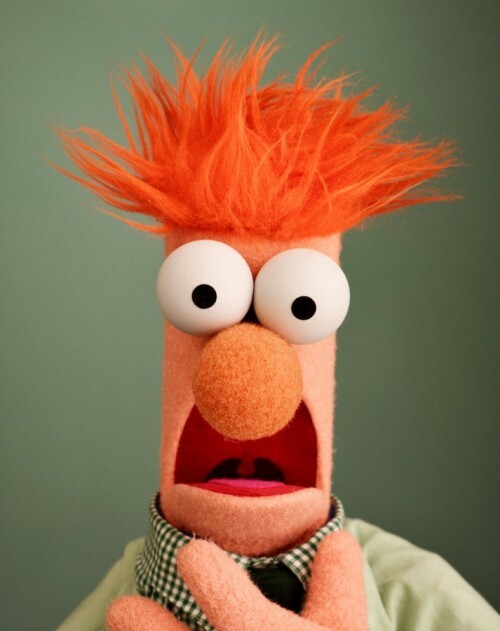 Then it hit me – it's Beaker from the Muppets." "Team-bonding Bayern-style according to Dante's Wikipedia entry." He couldn't do this again if he tried – it would have been a good test for goalline technology too. There are only so many ways to mess with a simple design of red and white stripes. If you looks at Southampton's all-red tops this season and feels that "it just isn't Southampton", then you should empathise with Lincoln fans. Every so often the club takes its traditional kit and pays someone to make it look crap. We've had fat stripes, thin stripes, micro-stripes, red-and-white quarters and, every now and again, "Arsenal". Though no one made quite such an arse of the design as this effort from Lincoln's only season above the fourth division in the past quarter of a century. It's a non-committal conglomeration of all the mistakes made in previous redesigns. It takes in thin stripes and fat stripes, with a medium stripe pasted down the middle for good measure. It randomly throws black – the colour of Lincoln's shorts – into the mix as well, while tinkering about with the collar and cuffs like an eager kindergarten waif with a new crayon set. The Lincoln Imp is hidden on the inside of the shirt's back, a clear sign of guilt that this hotchpotch jersey was a denial of club history.